Send bulk SMS to hundreds of thousands of people with our bulk SMS marketing platform. With Voodoo SMS, your business can reach its target audience en masse through bulk SMS sending to your marketing list. Deliver targeted marketing messages to prospects and generate leads for your business, or use our platform to keep in touch with your existing customers. From alerts to marketing messages, our user friendly platform is designed to make bulk SMS delivery a quick and simple process. With our volume-based pricing, you'll pay less for each text message the more you send. Start sending your SMS notifications and marketing messages now from just 1.74p per message with our cost effective platform and generate real results for your business. Why use bulk SMS for your business? SMS is one of the most effective channels for promoting your business. According to statistics from Ofcom, more than 93% of adults in the UK own and regularly use a mobile phone, giving text messages a serious advantage over email and direct mail when it comes to reaching your audience. Text messages are also more likely to be noticed than emails, much more likely to be read and far more likely to result in a response. With our bulk SMS delivery service priced from just 1.74p per message, sending marketing SMS is also far more cost effective than traditional direct mail. Your business can use bulk SMS marketing to reach potential customers with promotional offers and discounts, reach out to your existing customers to encourage repeat purchases and even to strengthen your brand. 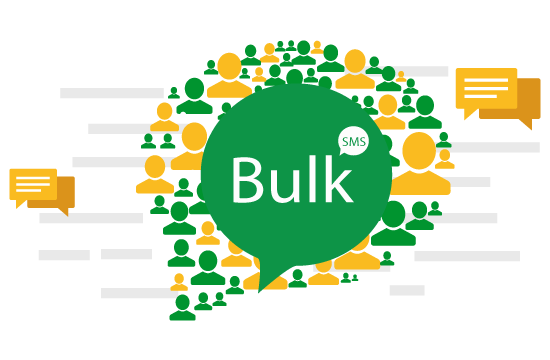 How does our bulk SMS service work? Our platform lets you deliver hundreds of thousands of text messages at once using bulk online SMS technology. Creating your account and delivering your first SMS broadcast is simple. Your campaign can start from just one message or scale to one million messages or more. Starting your campaign is a simple process. Create your account and fund your campaign using our SMS credits. Upload or create your contact list and write your first text message. Once your message is ready, you can broadcast it to your contact list straight away. Our platform also lets you queue up your message for delivery at a later date through scheduled broadcasting. You can even deliver your bulk SMS messages in small batches, making it easy to track results and respond to new leads as your campaign grows. Our bulk SMS platform lets you create dynamic text messages -- messages that include custom data such as a person's name. You can even receive messages from your target audience using our shortcode, making it easy for you to send out a targeted promotional offer. Use our bulk SMS API to integrate Voodoo SMS with your mobile or web application and keep in touch with your customers through a convenient, highly effective marketing channel. Our easy to use interface makes starting, customising and scaling your SMS marketing campaign simple. Our volume-based pricing model means the more messages you need to deliver, the less you'll pay to send each message. Start with just one message and receive discounted pricing as your volume increases, with our bulk pricing offering per-text pricing as low as 1.74p per message. Ready to start your bulk SMS campaign? Would you like to reach your target audience at a lower cost than traditional direct mail, and with a better open rate than email? Create your account now to launch your bulk SMS campaign and start connecting with new customers. Purchase upto 49,999 credits and we will add 50% FREE!